One of the best minds in history, a great physicists and a Jew himself,Albert Einstein criticized the creation of Israel by Zionist terrorists and called it a possible reason for future catastrophe for Jews. Many Jews who believed in Orthodox Judaism also oppose the state of Israel and consider Zionism as anti-Semitic. 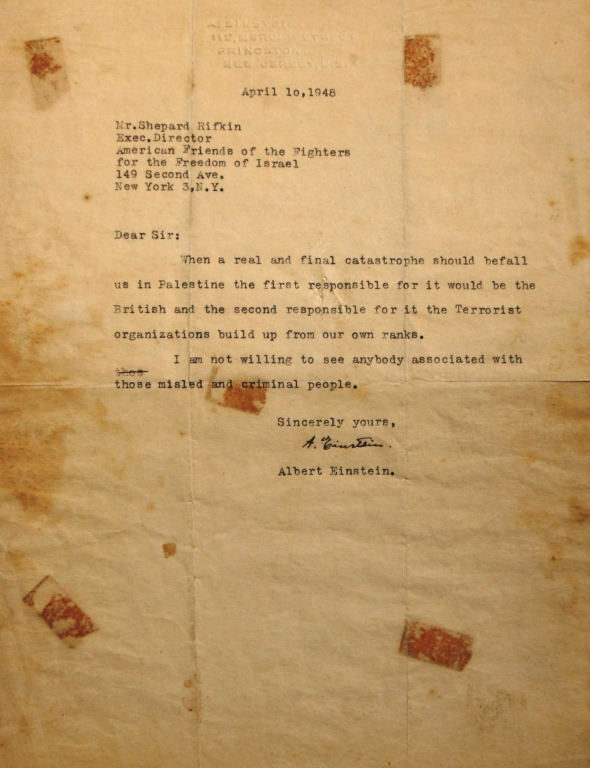 Below is the letter by Einstein to Shepard Rifkin on Israeli Terrorists. The letter was written on 10th April after the massacre of Arabs at Deir Yassin by the Stern Gang terrorists or Lohamei Herut Yisrael (LEHI) meaning fighters for the freedom of Israel. The Stern Gang terrorists were supported by American Friends of the Fighters for the Freedom of Israel and Mr. Shepard Rifkin was the executive director after the UN Partition of Palestine and prior to the creation of Israel in May 1948.